The 21st Conference of the Parties (COP21) to the United Nations Framework Convention on Climate Change (UNFCCC) is being held in Paris, France from November 30th to December 11th. 2.2 Greg Hunt extends the "Australia Clause"
2.4 Australia awarded "Fossil of the Day"
The African Union announced it will double the continent’s energy capacity by 2030 using only clean, renewable energy. Thirty developing countries from the Climate Vulnerable Forum pledged to support 100% renewable energy by 2050, as did 1,000 city mayors from around the world. A coalition has emerged at the conference of 105 of the most vulnerable countries that are after a 1.5℃ limit to global temperature rise. The fossil fuel subsidy reform communique, led by New Zealand, encourages countries to phase out subsidies to help limit global warming to 2 degrees Celsius, extending on previous commitments made by the G20 in 2009. Australia refused to sign the communique, even though Australian taxpayers subsidise the fossil fuel industry A$182 per taxpayer every year. $9.4 billion over the next four years will be handed out to the most profitable fossil fuel companies in Australia. Australian politicians are captive to “big coal” in particular – which donates to both major political parties. The communique – which was ceremonially handed over to the UNFCCC head Christina Figueres – stated that even a partial phase out of fossil fuel subsidies would generate 12% of the total abatement needed by 2020 to keep the door open to meet the 2°C target. Greg Hunt extends the "Australia Clause"
Environment Minister Greg Hunt got what the Turnbull government had keenly sought: the acceptance of accounting rules that allow Australia unrestricted access to the 128 million tonnes of surplus emissions credits it claims from the first commitment period of the Kyoto Protocol. That surplus will allow a big increase of emissions above current levels, and should the current upward trajectory of pollution breach the weak targets, Australia - once it ratifies stage two of the Kyoto Protocol - will get to tap international carbon markets to make up the difference. At present prices, UN certified carbon units are selling for under $1 a tonne - a bargain compared with the $13.12 a tonne paid by the Abbott-Turnbull governments under its $2.55 billion Emissions Reduction Fund. Hunt's success was to nullify opposition from tiny St Lucia in the Caribbean and South Africa to Australia's preferred definition of carbon emissions to include deforestation. Had Australian negotiators not prevailed, the country would likely have struggled to meet the modest goal of cutting 2000 level emissions by 5 per cent by 2020. Excluding land use changes, the increase could be as high as 11 per cent, Melbourne University estimates. Australia has come third last in an annual assessment of 58 nations’ climate policies, with only Saudi Arabia and Kazakhstan ranking worse. The assessment by Germanwatch and Climate Action Network Europe was released at the Paris climate summit, just one day after foreign minister Julie Bishop told the assembled ministers Australia was meeting and beating its climate targets and transforming its energy production. Australia awarded "Fossil of the Day"
Activists in Paris awarded Australia the "fossil of the day" award – a dubious honour given to a country that has done the most in the past 24 hours to stop a meaningful response to climate change, following a speech from Australian Foreign Minister Julie Bishop who stated that traditional energy sources such as coal would "remain a significant part of the global energy mix for the foreseeable future". "Barring some technological breakthrough, fossil fuels will remain critical to promoting prosperity, growing economies and alleviating hunger for years to come"
The final agreement was endorsed by 190 countries with the new treaty commencing in 2020. It is hoped that the deal will limit global warming - which threatens humanity with rising seas and worsening droughts, floods and storms - to well below 2 degrees Celsius, perhaps 1.5. Here’s what the many NGOs here in Paris think of the final draft. It’s overwhelmingly positive with caveats. Kelly O’Shanassy, Australian Conservation Foundation, CEO: “For the first time in history, humanity has agreed to limit pollution and create a pathway towards a safer climate. Now the real work starts and Australia, as one of the world’s biggest polluters, must do its fair share to cut pollution. “As we head into the 2016 election year, ACF urges Prime Minister Turnbull to listen to the millions of Australians and people around the world calling for a better future by making genuine changes that will unshackle our country from dirty energy and pave the way for a truly innovative renewable future. Ben Davison, Chief of Staff, ACTU: “It is crucial as we make the transition towards a net zero emissions planet that it is a just transition. “Working people, low income households, the poorest nations and their communities should not bear the costs of the Climate change whether through job destruction, lack of access to new energy sources or destruction of their Eco systems. Josh Gilbert, Chair, NSW Young Farmers: “The COP21 Paris agreement is an exciting time for Australia, particularly the Australian agricultural sector. “It is widely recognised that farmers are on the front lines of climate change and that there is a great opportunity for farmers to not only feed and clothe the world, but also power and empower our communities through renewables. “I also welcome comments regarding the importance of food security. In the next 35 years, farmers will need to double food production to feed an additional 2.3 billion people. While there will be challenges in Australia to help accomplish this feat, particularly climate change and urban encroachment, there is also a great opportunity to share our knowledge systems internationally with our colleagues. Jaden Harris, Climate Change Campaigner, Australian Youth Climate Coalition: “This historic agreement gives young people hope that a safe climate future is still within reach. We’re still on track for a 3-degree warmer world, which would devastate vulnerable communities worldwide, but now we have a structure to increase ambition and young people will lead the call to use it. Christoph Bals, Political Director at Germanwatch: "Our experience in Germany has shown that renewable energy can be scaled up rapidly with significant economic benefit. The decarbonisation signal from the Paris Agreement will increase and accelerate these benefits, but Germany still needs to up its game. Chancellor Merkel needs to commit to a plan to phase out the use of coal within the next two decades. The Paris outcome requires developed countries to come back next year with a credible plan for reaching their 2020 targets - that just is not going to be possible without a coal phase-out." Dr. Diarmid Campbell-Lendrum, Climate Change Lead, World Health Organization: “Every tonne of carbon that we put into the atmosphere turns up the planet’s thermostat, and increases risks to health. The actions that we need to take to reduce climate change would also help clean up our air and our water, and save lives. To take a medical analogy: We already have good treatments available for climate change, but we are late in starting the course. The Paris Agreement helps us take this forward and is a crucial step in protecting our climate and our health." The world has reached an historic agreement on climate change. 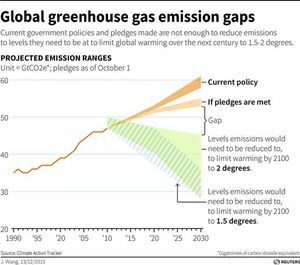 The deal concluded at the United Nations Climate Change Conference in Paris commits countries to take steps to limit warming to “well below” 2C relative to pre-industrial levels and to pursue “efforts” to limit warming to 1.5C. It also obliges developed countries to provide $100 billion per year in assistance to developing countries. But, unfortunately, the final negotiations dropped the one number that truly matters for the future of our planet: zero. George Monbiot: "By comparison to what it could have been, it’s a miracle. By comparison to what it should have been, it’s a disaster." "The Paris negotiators are caught up in a frenzy of self-congratulation about 1.5 degrees being included in the agreement, but the reality is that the reductions on the table are still locking us into 3 degrees of global warming. This will have catastrophic impacts on some of the most vulnerable countries and communities. And yet the deal seems to be shifting more responsibility on those countries who are least responsible for the problem, and the finance that has been agreed on is just a fraction of what is broadly agreed is necessary for those countries to cope with the impacts of climate catastrophe. The bullying and arm twisting of rich countries, combined with the pressure to agree to a deal at all costs, has ensured that the agreement will prevent poor countries from seeking redress for the devastating impacts of a crisis that has been thrust upon them." "What has been inspiring in Paris is the multitude of action on climate being taken by a huge cross section of global civil society, from small farmers, to indigenous people, to trade unions, to direct action groups. As politicians fail to respond to the crisis, people power is stepping up to meet the challenge." Is This The Beginning Of The End For Fossil Fuel Subsidies? This page was last modified 00:14, 21 December 2015. This page has been accessed 108,413 times.